Gov. 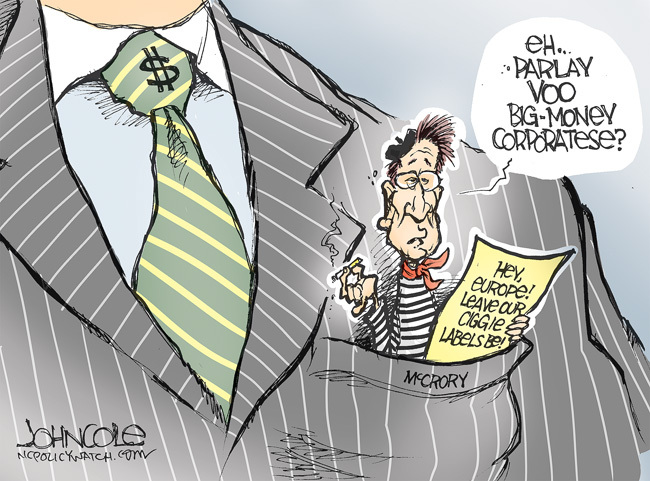 Pat McCrory took a rather startling and troubling position the other day when he spoke at the behest of a tobacco lobbyist against efforts in France and Ireland to further restrict cigarette packaging to promote public health. Apparently, kowtowing to the hometown industry is more important than protecting the lives and well-being of a bunch of anonymous furreners. Having established the precedent, however, maybe the Guv could follow up by doing the industry’s bidding on another matter impacting the health and well-being of kids he’ll never meet — farmworker children. Two years after the Obama administration backed off a rule that would have banned children from dangerous agriculture jobs, public health advocates and lawmakers are trying anew to get kids off tobacco farms. The new efforts were jumpstarted by a Human Rights Watch report in May that said nearly three-quarters of the children interviewed by the group reported vomiting, nausea and headaches while working on tobacco farms. Those symptoms are consistent with nicotine poisoning, often called Green Tobacco Sickness, which occurs when workers absorb nicotine through their skin while handling tobacco plants. Philip Morris International, which limits the type of work children can do on tobacco farms, says it would like to see stronger U.S. regulations in this area. Whatta’ ya’ say Guv? As long as you’re gonna’ be in the pocket of big tobacco, how about staying there when it would actually support a good cause?